Camille San Miguel, a pediatric dental resident at Cohen Children's Medical Center in New Hyde Park, performs an oral exam during Give Kids A Smile Day on Friday in Garden City. A record-breaking "Give Kids a Smile Day®” event saw more than 1,200 underserved and special needs children receive free dental screenings and oral hygiene instruction – as well as set the unofficial world record for the largest floss dance. 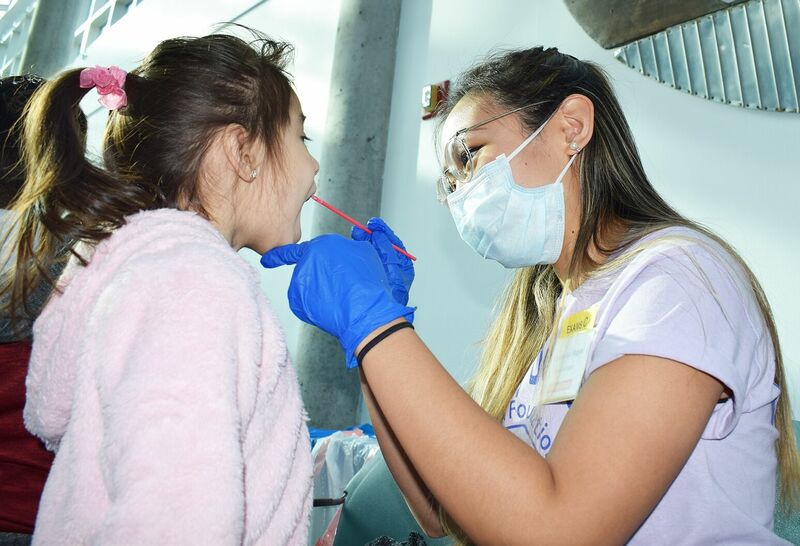 Dentists, hygienists and other medical professionals participated in the Nassau County Dental Society's 16th annual "Give Kids A Smile Day®" for children ages 4-8 on February 1 at the Cradle of Aviation Museum to mark National Children's Dental Health Month. More than five million children have been served nationwide – about 16,000 locally – since the event began in 2003 as part of National Children's Dental Health Month. The event, which puts the focus on children's access oral care, is part of an initiative by the ADA Foundation to help underserved children. Specially trained dentists will also assist in providing dental exams for children from the Henry Viscardi School, an Albertson, Long Island-based school for children with severe physical disabilities. This year’s event sponsors are the ADA Foundation, Henry Schein, Inc., the Nassau Academy of Dentistry, the Long Beach Lions Club, JetBlue, Northwell Health, Farmland Fresh Dairies, Fidelis Care, Liberty Dental, ProHEALTH, Project Accessible Oral Health, Sports Depot, Bagel Plaza of Merrick, and Patken Photography. Dental decay remains the most common chronic childhood disease. Low-income children suffer twice as much with dental decay as those from more affluent families. There are many thousands of children in this country who can't eat or sleep properly, can't pay attention in school, and can't smile because of untreated dental disease. Without relief, these children will face lifelong health problems – not just dental health, but overall health – and difficulty getting good jobs, to say nothing of the lack of confidence and self-esteem caused by their inability to smile. Not only did each child get needed attention from a medical professional along with the knowledge and tools to follow through with proper oral hygiene, but the children were all smiles for a different reason. They participated in the world’s largest floss dance.